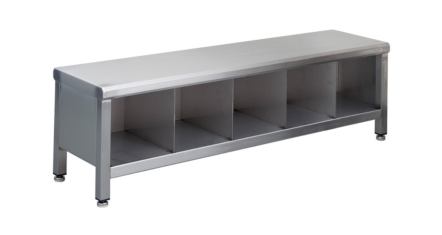 Envirosafe Ireland supply a wide range of stainless steel changing room furniture. To eliminate any possibility of cross contamination our stainless steel furniture and equipment are non particle shedding. All products are made from fully welded 304 grade stainless steel in a brushed dull polish finish. We offer a large variety of seating benches to give you more choice for you changing room. They can also be custom built to fit your exact requirements. Optional shelf for extra storage. 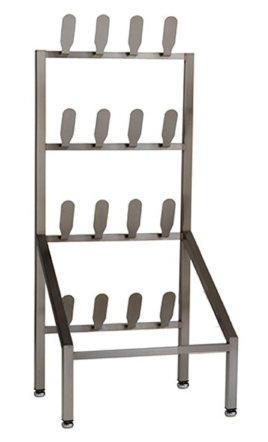 Shoe racks that are easy to clean, and keep footwear neatly stored and easily accessible. Space saving 8 pair option just 600 mm wide. Strong and sturdy paddles, ideal for shoes and galoshes. Freestanding, mobile or wall mounted options available. Built to last in tough and harsh environments. Multi tier and multi nesting available. Vented doors, Combination locks available and comes complete with stand.